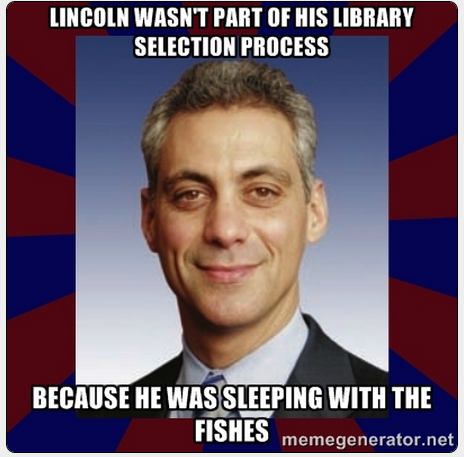 Rahm Emanuel: Abe Lincoln Sleeps With the Fishes? In discussing how he is trying to unify the Chicago bid for the Obama Presidential Library, Mayor Rahm Emanuel 'wisecracks' about how Abraham Lincoln wasn't involved in the 'site selection' process. Mayor Rahm Emanuel is notorious for making wisecracks, almost always at somebody else’s expense. But, targets of the mayor’s one-liners are normally there to either defend themselves or laugh with him. That’s not what happened Tuesday when Emanuel was asked about his efforts to make one unified Chicago bid for President Barack Obama’s Presidential Library and Museum. “You know the modern presidential libraries. President Clinton has his in Arkansas. Both Bushes [have theirs] in Texas. President Lincoln has his in Springfield, Il. I don’t think he was part of the selection process,” the mayor said laughing. It was an awkward moment. The never mentioned the reason why Lincoln was not around to choose the site for his presidential library. He was assassinated on April 14, 1865 by John Wilkes Booth while attending a play at the Ford Theater in Washington D.C.
Now we don't totally want to defend Da Mare and maybe point out something that Fran Spielman glossed over herself? Even if President Abraham Lincoln survived his assassination attempt and retired from the White House, were Presidential Libraries even a thing back then? Our quick look says they were started after Herbert Hoover's administration back in 1933? So...no, he wouldn't have participated in the process anyway. But...that doesn't let a juicy headline get in our way here at the Truth Team! Still...we all know what Rahm was thinking. The meme says it perfectly.